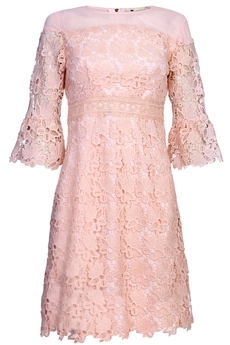 Guipure Lace Evening dress is perfect for special occasions. This gorgeous dress oozes sophistication. Made from delicate guipure floral lace in a slender fit, it’s styled with a sheer panel across the shoulder, fitted waist and cropped fluted sleeves. It’s finished with exposed gold Yumi logo back zip fastening, it is fully lined and is approx. 100cm in length. Summer collection. Composition: 100% Polyester. Color: Blush.